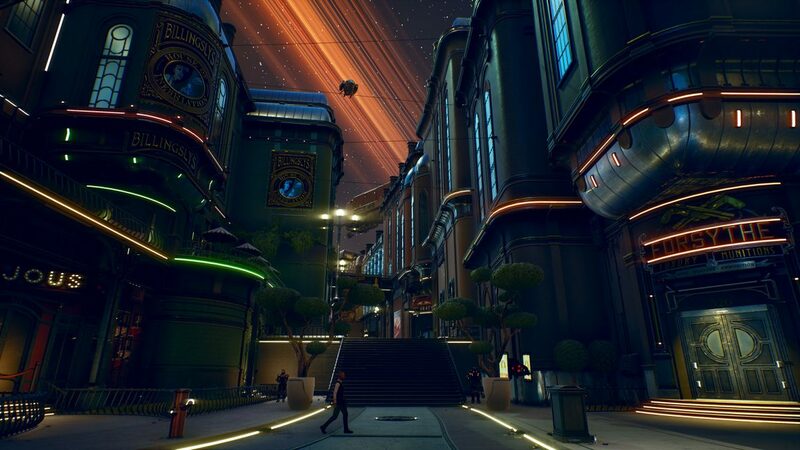 In the gameplay demo for The Outer Worlds at PAX East, we were shown a snippet of Byzantium, one of the game’s explorable cities: a corporate dystopia seeped in advertising. In 2019, the holy scripture of game design says thus: thou must have crafting or the kids won’t like your video game. Well, Obsidian doesn’t care. The developer isn’t adding crafting to The Outer Worlds because it doesn’t make sense in the context of the story it’s trying to tell. This is a world where people are slaves to late stage capitalism, with advertisements floating around on drones, plastered on billboards, and even uttered in casual conversation. If you want something in this world, you buy it. “One of the reasons we sort of shied away from it was with all the corporate branding that we had,” lead designer Charles Staples told USG. “We felt like doing a lot of your own crafting sort of took away from one of those themes that we were trying to hammer on quite a bit and get across. If you want to check out the PAX East gameplay demo of The Outer Worlds, check that link. If you’re mad about the lack of crafting, you can vent your frustration by killing literally every NPC in The Outer Worlds.